Delicious, the social bookmarking site has been pretty quiet for the past couple of months. While the site is still alive and kicking nothing much has been heard from it for a long time now. No news, no updates and no new features, until now. And guess what’s keeping the Delicious folks busy? 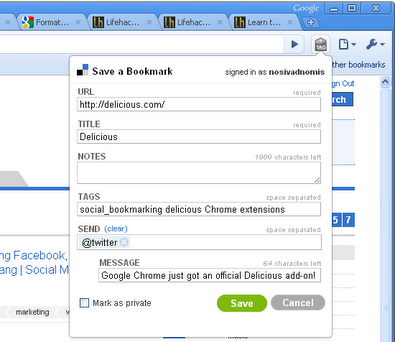 A Delicious Extension that sits right on your Google Chrome’s toolbar. Yes folks, you read it right, Delicious a Yahoo property just got a new iteration as a Chrome extension. Don’t get me wrong here, there’s nothing utterly incorrect about this. It’s just don’t I don’ t really expect Delicious to make its presence felt anew by way of Google Chrome extension. Anyway, what does this early beta of Delicious Chrome Extension has to offer? Pretty much actually. It lets you sync your Delicious bookmarks, get all your bookmarks right on the Chrome Omnibar, bookmark a current page in just a click of the Delicious button and search your bookmarks right on the current Chrome tab you are viewing. The Delicious Chrome Extension works pretty much the same way as other Chrome Extensions. But to guide you in using it properly, the Delicious team has prepared this guided tour. And to install the Delicious Chrome Extension, just click this link. After installing you just need to register your Delicious account and you’re all set to go.